Destinations is set to take a walk on the wild side as it returns to Earl’s Court, London in 2011 with BBC Wildlife Fund as the official charity. There will be over 450 travel companies, from Escape to India and Africa Explorer to dedicated wildlife charities The Wildlife Trusts and The Wildfowl & Wetlands Trust, all ready to provide expert advice and inspiration for the ultimate trip in 2011. Imaginative new features create a whole new travel show experience – Animal Man and Animal Magic will be attending the London show with meercats, armadillos, owls, scorpions and spiders. Interactive features will further ignite the travel imagination with Nambia Tourism re-creating a ‘hide’ to transport people to Nambia Etosha National Park and experience fascinating wildlife in action by streaming live footage. In addition the new Touch, Taste and See the World features will invite visitors to learn Russian dancing as well as tasting fine rum from Barbados. There is a superb line-up of inspiring speakers who are passionate about both travel and wildlife including TV presenters Michaela Strachan and Richard Terry who will be talking about their most exciting wildlife encounters, broadcaster and birdwatcher Bill Oddie well as BBC Zoologist Mark Carwadine and the McClements family from Channel 4’s ‘My Family’s Crazy Gap Year’. The Show will also provide culture and entertainment from around the world, including salsa dancers and Caribbean Steel Drums. With every ticket purchased, a donation can be made to the BBC Wildlife Fund. Experience wildlife first hand at Destinations Birmingham with Tropical Inc who will be bringing a range of creatures from all over the world including a Genet (leopard cat), a Coati, Harris Hawks and Meerkats. The official Show charity is BBC Wildlife Fund and visitors will have the opportunity to meet the charity’s dynamic speaker and marine biologist, Monty Halls, who will provide top travel tips and inspiration. Destinations Birmingham will fuel the travel imagination and makes for a fantastic day out with a vast array of exhibitors including India Tourist Office and The Adventure Company providing holiday choices from around the world. The World Entertainment Stage will showcase Touch, Taste and See the World features, inviting visitors to enjoy food and drink tasting sessions, learn new arts and craft skills and take part in dance workshops. There will be a Meet the Experts Theatre featuring Zoologist and TV presenter Mark Carwadine, bestselling author Simon Reeve, multi-award winning journalist Ben Anderson and the Willmott and McClements families from Channel 4’s My Family’s Crazy Gap Year. Visitors will be able to book holidays at the show and take advantage of some sensational travel offers. 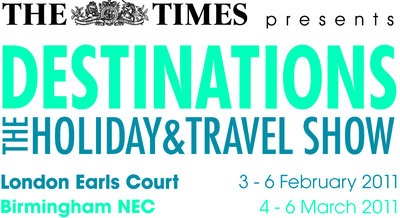 Free advance tickets (paying just a booking fee of £1.40 per ticket) to Destinations: The Holiday & Travel Show in Birmingham are available from destinationsshow.com. Tickets on the door are £10.